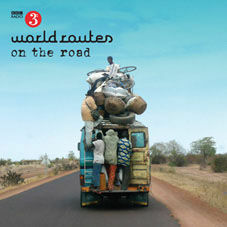 BBC Radio 3's flagship world-music show "World Routes" has just released a 2-CD, 30 track compilation (on the Nascente label - NASCE001) of previously unreleased material recorded on location by the World Routes programme over the last ten years, featuring some of the most thrilling artists from across the world, including Grammy award-winning Toumani Diabaté, Tito Paris, Ilham Al Madfai, Alim Qasimov and more. The double CD (and 44-page booklet) was put together by the series' presenter Lucy Duran and producer James Parkin. Lucy is one of most in-demand world music producers who’s lent her touch to Toumani Diabaté, Bassekou Kouyate and Yasmin Levy. She is also a lecturer in African music at the world’s leading university of world music, SOAS. Lucy has been going backwards and forwards to Mali researching the music of its flamboyant divas, receiving her doctorate in 1999.
outrigger canoe and snowdrift, Lucy and James have done it all in the name of preserving the musical cultures of the world. This event is part of Southbank Centre’s weekly Friday Tonic series. Also featured on the compilation and performing at the launch event will be Hari Vrndavn Sivanesan, a young veena player from the UK who was the recipient of the BBC Radio 3 World Routes Academy scholarship in 2011. Hari has toured with sitar maestro Ravi Shankar and was chosen by him to perform on the Chants of India album, produced by Ravi and George Harrison. At the launch, Lucy Duran and James Parkin will talk about some of the highlights of their travels over the last decade as well as signing copies of the album which will be on sale.